Cleanroom sticky mats are multi-layered adhesive floor mats designed to capture and remove particulate from foot and cart traffic before entering a clean environment. Our tacky mats are designed in a multilayered form and are robust enough to endure both foot and cart traffic. As a layer becomes contaminated, it can be removed, revealing the next clean layer without impacting the integrity of your cleanroom environment. Moreover, since the individual layers feature numbered corner tabs, you can have a visual cue for when the time comes to change the mat. 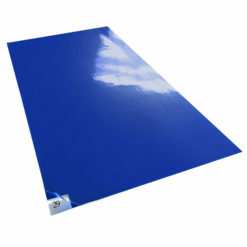 Why Choose Blue Thunder Technologies for Sticky Mats? It’s our goal to provide the most comprehensive selection of quality and cost-effective sticky mats. As a leading manufacturer of tacky floor mats, we can offer factory direct wholesale pricing. Our Thunder Mats™ are trusted in cleanrooms, labs, and industrial settings worldwide. In addition to our wide variety of sizes and colors, our mats can be customized to fit unique requirements and configurations. Browse our selection of regularly stocked mats and mat frames ranging from 18″ x 36″ to larger options (36″ x 35″ & 36″ x 60″). Available colors include white, blue and grey. Cleanrooms are demanding environments. Any contaminant entering the cleanroom environment can have serious consequences. This is one of the reasons that cleanroom employees are among the most disciplined workforces you can find. Everything counts, and this starts before they even enter the cleanroom. Cleanroom sticky mats can be considered the first line of defense for any cleanroom environment. They make sure that no pollutants enter your cleanroom as they trap residue dust particles or pyrogens that may inadvertently have found their way onto an employee’s footwear. When choosing your tacky floor mat, you need to take into account several criteria, including not only the effectiveness of the mat but the size and color as well. In the world of tacky mats, we’ve found that the most popular size tends to be 24” x 36”. However, in many cases a larger size, such as 36” to 60” captures more steps and contamination. Your cleanroom tacky mat needs to become an obstacle that must be trod upon, before entering the cleanroom proper, so you need to ensure it covers the threshold effectively. A sticky mat also needs to be tacky and robust enough to endure the constant treading of a large crew otherwise you’ll be changing your mat very frequently, creating a logistical nightmare. It also needs to fulfill its requirements without becoming a trip hazard for cleanroom employees. It might seem redundant to color a product that’s disposable. Though aesthetics are important, there’s a deeper more functional reason for the color variations in clean room sticky mats. A cleanroom environment works as a whole, where the room, the material within, and its employees work together. The coloring of the mats is essential in this dynamic relation between room and staff. The colors can help delineate different areas within the cleanroom. Gray tends to designate less important areas. 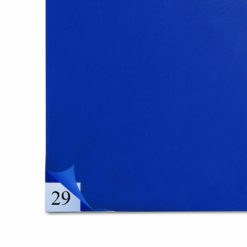 Blue is the code for intermediate areas of importance. White indicates critical areas within the cleanroom environment. This code is a very important visual cue for staff, constantly reminding it of the importance of protocol within the coded area. It’s important to remember controlled environments and manufacturing facilities often develop their own color coding systems. For any further information, don’t hesitate to contact one of our knowledgeable sales reps.